Slowly but surely, glasses-free 3D displays are getting bigger. When it comes to 3D, a lot of people get hung up on the issue of glasses. Wearing glasses over your existing glasses, or just wearing glasses in the first place, can be a real turn off. But of course, glasses-free displays have been limited to incredibly small screens. The DX2500 is a step forward, taking the glasses-free display up to 25 inches. 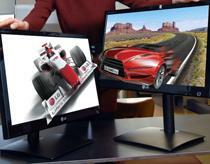 LG says they've solved the frustrating problem of viewing angle by adding a head-tracking camera to the monitor. If you move your head while watching a movie or a game, the monitor will adjust accordingly so you don't lose the 3D picture. LG's glasses-free DX2500 is out in Korea now and will be launching in the US early next year at a price of $1,100.